Many times you feel a need to resize images. There might be several reasons for doing so. You might want to share your photos on a social networking site like Facebook, Orkut etc. or you might want to email it to your friends. Whatever might be the reason, you may resize your original image files by converting them to a smaller resolution in different formats using PIXresizer. 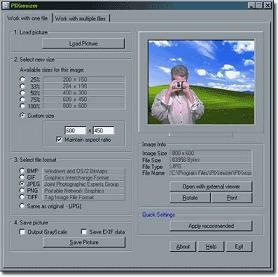 PIXresizer is a file conversion tool which allows you to convert/ resize a single image file or do a bulk conversion of multiple image files. This tool shrinks down the overall file size without compromising much with the original quality. Whichever way (single or bulk) you wish to do it, you need to follow only four simple steps. First of all, you need to load the image that you wish to convert. If you have multiple images to be converted, you may browse to source folder and the destination folder so that all the images in the folder are converted together. You need to choose the new file size that you wish the images to be converted to. It may be in terms of resolution or shrunk percentage. For Example, you may choose the output to 1632×1224 resolution (if the original image has 3264 X 2448 of resolution) or 50 percent. Then, choose a preferred file format amongst JPEG, TIFF, BMP, PNG and GIF. You may choose not to change the format and maintain the original file format. Finally, save the converted image files either to EXIF data or output GrayScale. This freeware can be easily downloaded from Here.